This level have normal difficulty and you need to use good technique to complete this level. 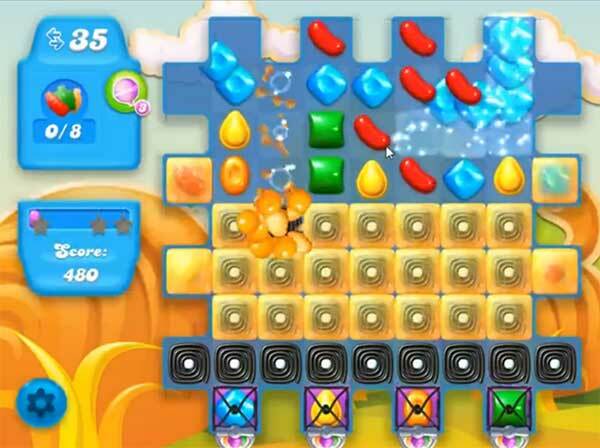 For this level you should try to play near to blockers to break them and as you will have more candies to play then make special candies like colorbomb by combining five same color candies. After combine colorbomb with other special candy to break more blockers. After play more from the bottom and break all blockers that blocked the soda bottles. Then break soda bottles as soon as possible to reach the target within 35 moves. this level would be a whole lot easier if the fish weren’t so retarded. What do you mean “normal difficulty”?? This is a “hard” level.